Newly available ONE BEDROOM STARTER HOME situated on the popular Grange Farm development which has been updated throughout and is offered with vacant possession and no onward chain. Whilst being in close proximity to local amenities. The property benefits from having a storage area, two allocated parking spaces, On the first-floor bedroom, open plan lounge, kitchen, and diner. ENTRANCE LOBBY Front door to hall with stairs leading to the first floor, Smoke alarm. BATHROOM	Double glazed window to rear, enclosed bath with mixer shower attachment, pedestal wash and basin, low-level Wc, extractor fan, shaver point, and three downlights. LOUNGE/DINING	13'4" x 11'5". Double glazed windows to front and rear, cupboard housing combi boiler for heating and hot water, one radiator and access to loft space. Kitchen/Diner area 7'8" x 7'2". Arch from the lounge to the kitchen, double glazed window to rear, stainless steel sink, a range of base units with eye level cupboards with spacer plumbing for auto washing machine, electric hob, and oven, extractor hood. BEDROOM 11'5"x 7'6". Double glazed window to front, one radiator, built in wardrobe. Disclaimer - Property reference ASCOT20MASTERSON. The information displayed about this property comprises a property advertisement. Rightmove.co.uk makes no warranty as to the accuracy or completeness of the advertisement or any linked or associated information, and Rightmove has no control over the content. This property advertisement does not constitute property particulars. 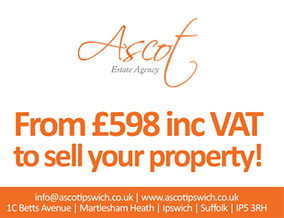 The information is provided and maintained by Ascot Estate Agency, Martlesham. Please contact the selling agent or developer directly to obtain any information which may be available under the terms of The Energy Performance of Buildings (Certificates and Inspections) (England and Wales) Regulations 2007 or the Home Report if in relation to a residential property in Scotland.